FRANKLIN, Mass. – It was becoming a frustrating night for the visitors. 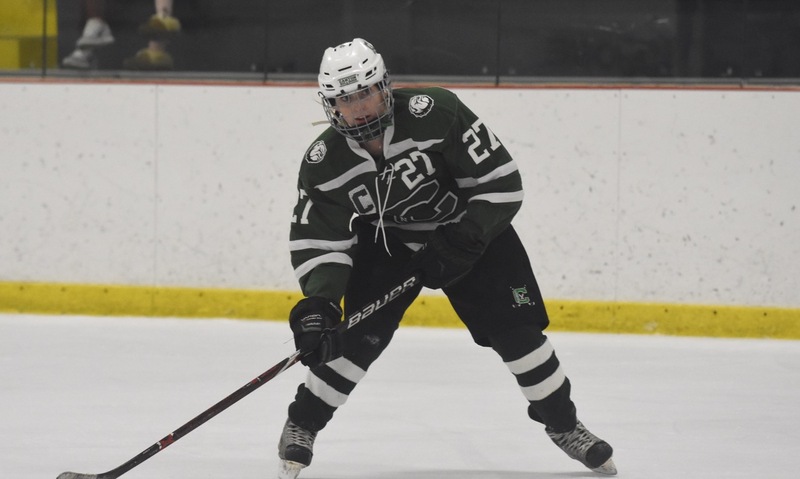 Canton held a 15-1 edge in shots on goal during the second period against Franklin in Wednesday afternoon’s Hockomock League tilt at Pirelli Veterans Arena, but went into the second intermission locked in a scoreless tie. “It really doesn’t bother us that much because we’ve been in so many of those late games,” said Canton coach Dennis Aldrich. “All through the playoffs there were late goals and we just never feel like we’re out of it. If we don’t win, we just feel like we ran out of time. 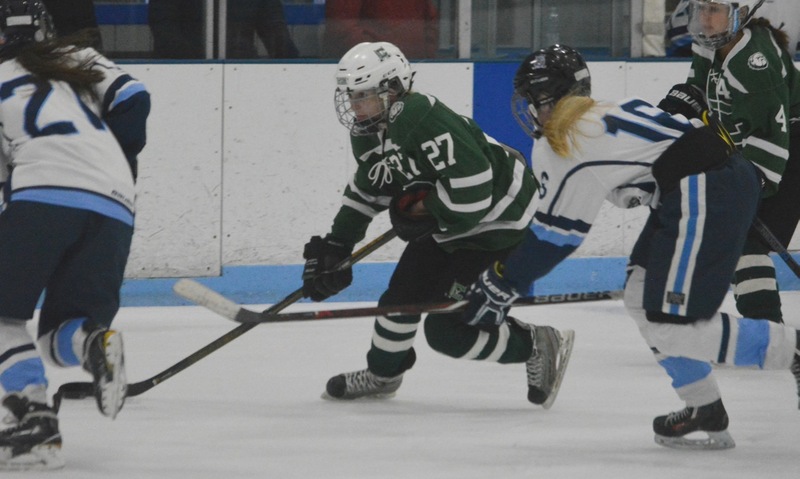 Thirty seconds into the third, Leah McClellan fired a shot from the point that was deflected by skates right in front of Franklin freshman goalie Natalie Stott (30 saves) and onto the stick of Farrelly (goal and an assist) at the back post for a tap in. Canton nearly doubled its lead a few minutes later, but Stott stood tall to stuff fellow freshman Ellie Rae Roberts’ breakaway opportunity. 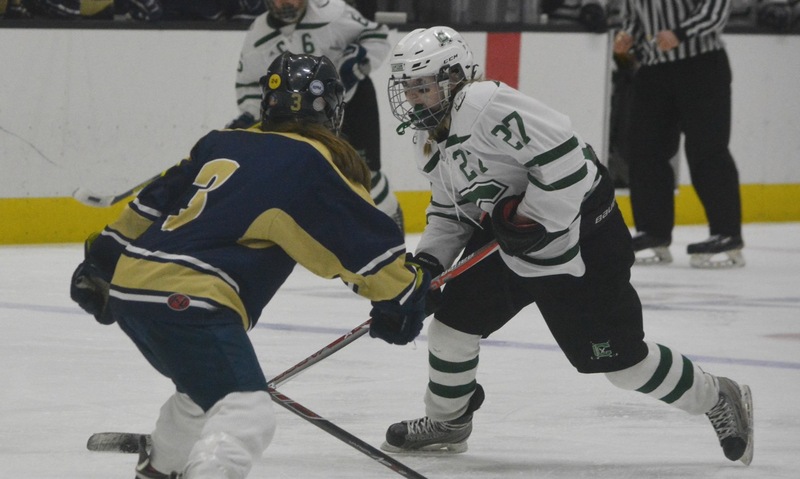 With just under three minutes to play, Franklin had a chance to tie the game with a shorthanded break by sophomore Jordan Dwyer, but her shot under pressure from Alexa Maffeo was knocked aside by Canton’s senior goalie Colleen Kelleher (19 saves). The Bulldogs put the game away just 30 seconds later. Malloy (goal and assist) skated free into the slot, opened her body to get a forehand shot off, and put her wrister just under the bar for a 2-0 lead with 2:14 to play. It took a full period for the Bulldogs to get going, as Franklin came storming out of the locker room and took control of the play in the opening period, finishing with a 13-8 edge in shots. 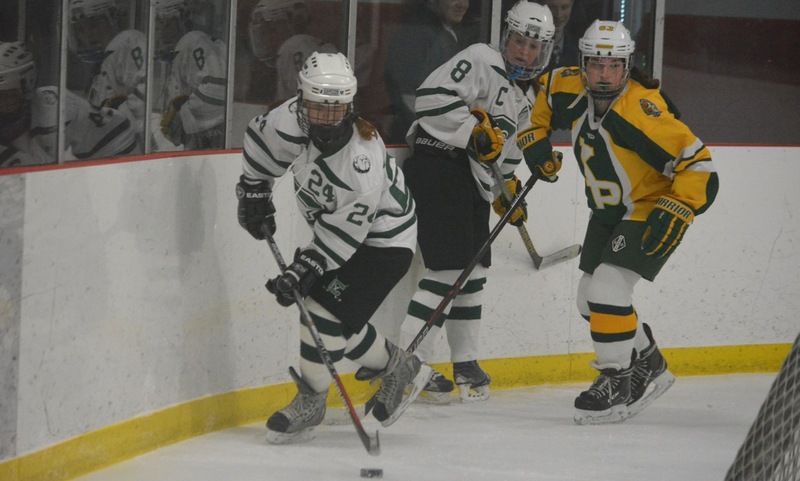 Regan Paterson had the first chance with a couple of shots from close range and had another chance when she stole the puck on the back-check and skated the length of the ice to force Kelleher into a save. With 50 seconds left in the first, Franklin nearly took the lead. Gianna Cameron had a shot from the point saved by Kelleher, who then recovered quickly to make a pad stop on Jackie Connelly’s rebound effort on the post. 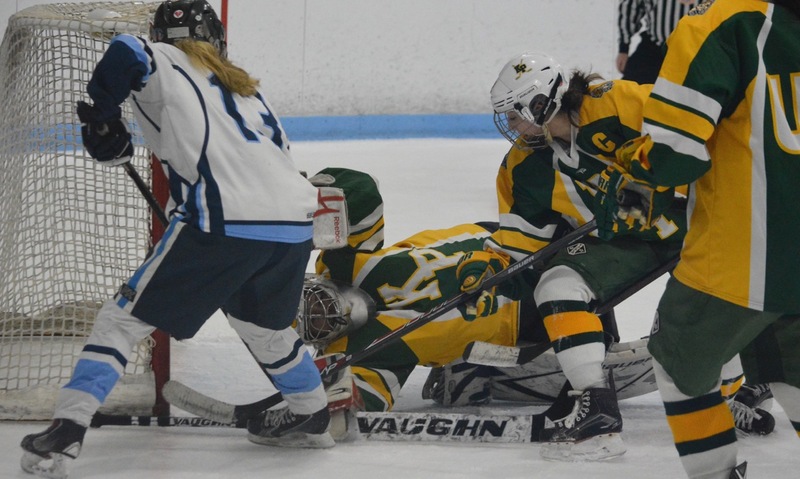 Stott also had to make big stops to keep Canton off the board in the first, particularly a great pad save on freshman Lizzie Tassinari after Malloy teed her up in the slot and a save on Farrelly seconds before the horn. Those saves were just a prelude to the Stott’s performance in the second period, as she stopped a barrage of shots from the Bulldogs and kept Franklin in the game after 30 minutes. 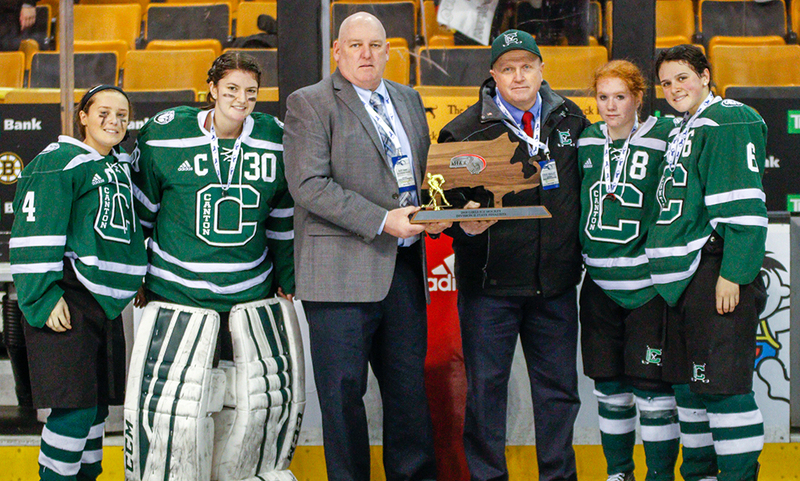 Lauren Fitzpatrick had an effort cutting in from the left wing stuffed by the rookie netminder, who then stopped a blast from the point by Katie Trerice and the rebound effort by Marissa Devane. Meg Aldrich also had a shot from the point through traffic that forced a blocker save by the unsighted Stott. Canton grabbed the momentum after the second period and never looked back, which Aldrich explained is part of the game plan for the Bulldogs. While praising the play of Stott, Aldrich admitted that he is also experimenting with the lines to try and boost the Bulldogs’ offensive output. “We’re still trying to find chemistry,” he said. Despite the loss, Burke is pleased with the performance of her young team and the strong start that the Panthers have made to the season. Canton (4-0-2, 2-0-0) will look to continue its unbeaten start to the season when it hosts Mansfield/Oliver Ames on Saturday. Franklin (4-1-2, 0-1-2) will try to bounce back quickly when it travels to Stoughton on Saturday afternoon.